How far apart to plant? 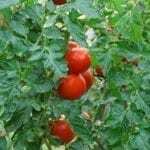 Tomato plants are 12 inches. You should try to space them at least 24 inches to provide each plant with ample sunshine and good air circulation. Depends on how much room u have. I have all the room I want so I space them 4 ft apart and use cages made from rolls of fencing. Sometimes they still end up growing together with next plant if I let them. But whatever space u have will work. You may have to trim them up to manage them.But it will be an adventure worth taking .